Christmas came a little early for me when I opened this brightly wrapped, autographed book! I met a couple new to me authors on this journey back to a different time. Nothing is perfect and there are many twists, mysteries, and surprises along the way but each of the 9 novellas has a happy ending. I highly recommend this book for all historical Christian fiction fans especially those that love unique Christmas love stories. This book makes a perfect gift for yourself or your favorite book lover. Some feelings on each novella. Good story! It is clear that Marianna and Tristam belong together. Miss Nowell seemed to know it too. ~Star of Wonder by Susanne Dietze Much mystery involving the stolen diamond necklace. I loved the children being seen and heard, not stuck in a nursery with a nanny. I loved how Bennet and Celeste became more than friends despite their desire not to wed. Love finds a way! A very sweet Christmas love story. Lily and Andrew have been writing each other for a year. In the beginning, was about some old letters but as time went on, things became more personal but she only signed her letters with an L. He comes to lecture at the Smithsonian Institute where Lily faints. He sees that she gets home and after much discussion, he realizes who she is. I loved Lily's parents. The secret is very touching and Lily gets her longtime wish. Misunderstandings and other confusions keep Rufus and SarahAnn apart. Love, however, does find its way. I can't imagine bringing a house in pieces from England to New York. Rufus will do anything to make sure his ailing mother is happy. SarahAnn goes above and beyond in caring for her too. A very nice story with a bit of mystery regarding the elder Mr. Sedgewick too. Their late mother's agreement forces Christopher and Ashleigh to be in the same place at the same time. Neither one wants to marry. But...The child she disliked most in the world had somehow become the man she adored. A sweet story! A wonderful story! I loved how Percy and Eugenie meet then meet again. I loved the work Eugenie does with the war widows. With the help of Eugenie and her Sugarplum Ladies catering, what was going to be a lonely Christmas turned into a wonderful family & friends reunion. The ending was perfect! A dare. A kiss. A separation of hearts. Years later will the two hearts find forgiveness and love again? This was a bit heart wrenching to see a mother forced by her late husband's will to give up her son. I enjoyed this story. I loved what the Paper Snowflakes were made of, you will too. I really liked this story. I did not like Fern Kent at all! She was a controlling, shrew of a mother-in-law. Blaming Beatrix for her death the death of her son and more. UGH! I loved little Clara and her father Hugh. He was such a sweet gentle, man. He did so much to help Beatrix. How she helped him pick out a doll for his daughter's Christmas gift was so sweet. Mean old Fern stirs up trouble. Will the truth bring healing and love? I loved the Christmas in this story. This truly was a perfect Christmas! I love how the author used Charles Dicken's "A Christmas Carol" in Melisande's window design and in Gray's heart. I was happy with the ending but would love to read more of Melisande and Gray's story as well as see what becomes of Vonetta in the future. As you can see, I really do love this collection! 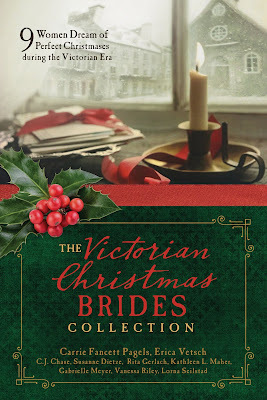 GIVEAWAY: A copy of the paperback of The Victorian Christmas Brides Collection autographed by Carrie (and maybe even a couple more authors!) Answer this question to enter: What's your favorite thing about Victorian era Christmases that you've read about? I don't know a lot about Victorian era Christmases, but it seems that that was the time when a lot of our traditions were established. Thank you for your review. This sounds like a great book. It's a great collection, Susan. Lot's of happy ever after endings. I always find it amazing how much they decorated then. I love the Christmas balls, the meals and how they decorated. It seems like they went all out to celebrate. There are several decoration and meal scenes in this book. I think you would like it, Joy. I loved the detail the authors shared in their novellas. I love Yule logs and caroling. Hi, Nancy! I do not have a fireplace but have continued the Yule log tradition with a modern day twist. There is a tv channel that shows a Yule log burning, though it lacks warmth it is beautiful to watch. Most Victorian era Christmases give us a glimpse into the parlour games played. Charades for one. Oh, yes! Parlour games! I used to be very fond of such games. Technology has taken over so many things. I often wonder if today's young people would even know how to play the old games. Thanks for coming by, Mary! I'd say the elegance of that era. The gowns were so beautiful & the homes were gorgeous. Lovely ballrooms bathed in candlelight...amazing! Hello, Robin. Things were so lovely then. Even the simple homes seemed to have a special elegance at Christmastime. What a pretty cover. From what I remember about victorian christmas's is was very festive. Full of parties with lots of pretty dresses and lots of food. I love the cover of this book in person. Photos fail to show the deep, deep green against the red. Thanks for coming by, Lori! I enjoyed each novella in the collection and I love the book cover! You are so kind, thank you, Tina. I'm glad you enjoyed the book. Decorating the Christmas tree wasn't a major production like it is now. Home-made ornaments, popcorn and cranberries strung on a string, and gifts that were made with love. I think the making of the ornaments and of decorating the tree or even just an evergreen bough were part of the family celebration. Thanks for coming by, Janet! Hi, Melanie! I think it would be lovely to bring back some of the old traditions. Though, there are a few modern ones I will keep. I enjoy reading about the Victorian traditions. Andrea, Thank you for a lovely review. I enjoy reading about the Victorian traditions too! There are a couple new ones in these novellas that I didn't know about. Thanks for stopping by Caryl! The fun traditions that I didn’t know much about until I read the first Victorian Christmas novel. Hi, Mindy! I read that Queen Victoria had roast Swan along with other roasted meats for Christmas. I can't even imagine that.